Mild-mannered Clem "Sandy" Sandover has secretly and meticulously embezzled $201,000 over many years--company audits don't even reveal the missing money! There is, however, other trouble at the company, and when the executive secretary leads Sandy on, and tries to get him in big trouble, she ends up dead. It's not Sandy but his wife Beth, the previous executive secretary of the company, who is accused of killing her. Beth hires her old friend Perry Mason to go to trial for her. Continuity Error: Watch the briefcase in the opening sequence. Clem puts it on the desk with the handle facing towards the desk chair. When next seen, the briefcase has magically turned around, ready for Clem to fill it with money. Submitted by daveb, 11/25/2007. When Sandy frantically closed the safe in the office after placing the $45,000 inside, he left the safe handle pointing southeast and hid just as Mr. Sellers and the security drivers entered; as Mr. Sellers opens the safe, the handle is pointing straight down. jfh 07Nov2016. Location: The interior seen in the opening is that of the Bradbury Building. The large center opening has been used in many show shots. Show picture and more here. Submitted by Mitch English, 1/11/2006. + As noted above, the famous Bradbury Building is used to great effect in this episode. Perhaps the most recent use of the Bradbury Building in film is in 2011's The Artist, which won the Academy Award for Best Picture. There is a symbolic scene in The Artist in which Peppy runs into George on her way up the Bradbury staircase (and to stardom), while George is on his way down. Stuart Erwin's stairway descent is also effectively used as symbolism in this episode of Perry Mason. Submitted by Fifty-Niner on 23 April 2012. + Thank you, Mitch and Fifty-Niner. The minute i saw that interior, i knew i had seen it before, but i figured i would never find out where it was. This website -- and folks like you two -- make watching the series a lot more fun. Submitted by catyron, April 22, 2018. Uncredited Actors: Don Anderson appears as one of the uniformed armored car guards who pick up the money that the frantic Sandy Sandover barely manages to return to his office. Submitted by FredK, 25 Oct 2010. Joan Staley was the centerfold Playmate for November, 1958. See here (SFW). She retired following a horse-riding accident a few years after filming this episode. Submitted by CGraul, 8/18/2011. + Safe For Work ?? I don't know where CGraul or DyNama work, but please, please tell me they're hiring !! Seriously though, it's hard to believe she would have posed at only 18 - if IMDB is correct - as 21 was then the common age of majority...particularly for something like "calendar art". Submitted by Notcom, 020216. CARS. (1) Santa Fe Diesel Locomotive Number 20, a General Motors EMD F3 in ATSF's Warbonnet paint scheme, hauls Clem Sandover's train to Phoenix with the help of three B-units. No 20 was built in November 1946. Her sister, No 19, had a little accident in 1948. A full-scale reproduction of No 19 is seen in Rex Rexroth's bedroom in the 2003 Coen Brothers movie Intolerable Cruelty ("Santa Fe tarts" scene). (2) Clem gets home in a 1962 Ford Galaxie Mainliner 4-Door Sedan TAXI, light color, Licence Number R36 014. (3) Paul drives his black 1962 Thunderbird Convertible to Lita Krail's place. (4) Outside Lita's place, strawberry farmer Cyrus Potkin is fixing his drab 1946-1950 Diamond T Cab-Forward truck, Stake-bed w/ canvas cover, possibly Model 509SC (capacity 2-3� tons). Diamond Ts have a very cool hood ornament. The dialogue tells us that Clem has a car but we don't get to see it. I bet it's a Rambler Six. Added by Gary Woloski, 6/21/13. It's for you, Mr. Mason: Perry's questioning Mr. Banks in his office when his secretary, Sally, interrupts; there's a call for the counselor at her desk. Paul Drake has tracked him down again. Submitted by francis, 11/13/14. Stuart Erwin does an excellent job portraying a man in the grip of greed and guilt in this episode. This is quite a change from his earlier comedic roles. Personally, I will always associate him with the role of the unlucky-in-love hypochondriac Tommy Nash in the 1933 W.C. Fields film, International House. It's amazing that he had the range to seemingly have a total breakdown, complete with sweat and tears, in this Perry Mason episode. Submitted by Fifty-Niner on 23 April 2012. His (Stuart Erwin) acting in this episode is certainly notable ... I can think of few PM villains who have made me dislike them more, while also finding them darkly funny. Erwin's 'Clem Sandover' is a nasty piece of work, disloyal to wife and his employer all at once. But I had to laugh at his dialogue as well .. "I bought a sport coat!" Wow! Submiited by MikeReese, 2/13/2017. I love Stuart Erwin in almost any role, comedic, dramatic, or villainous. He did not disappoint his time either. Submitted by catyron, 04/22/18. Does anyone else feel that TCOT Double-Entry Mind belongs in the Twilight Zone? The eerie night scenes in the Bradbury Building, culminating in the ironic sound of Sandy's tape recording as he sidles down the stairs, seems inspired by Perry's friend Rod Serling. Submitted by 10yearoldfan, 13 September 2013. 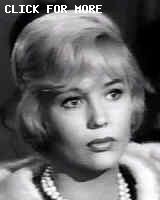 Blonde Della: I enjoyed seeing Della (briefly) as a blonde. Is this the only time in the series when she wears a wig? Submitted by DellaFan, 10/11/2014. To my mind, this is by far the best episode of Season 6. It's Stuart Erwin's episode (and he takes it and runs with it), but he is assisted by a couple of neat plot twists and the truly noirish atmosphere of the Bradbury Building, as mentioned above by 10yearoldfan. Add Kathleen Hughes as a terrific (and, of course, duplicitous) femme fatale and what's not to like? Submitted by BobH, 20 March 2017.